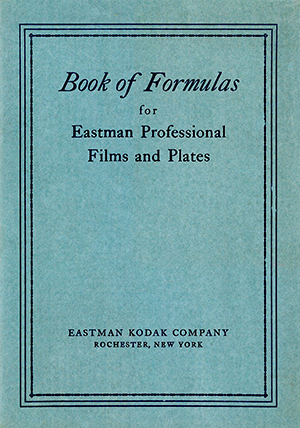 These Formulassupersede all others published in direction sheets and instruction books to date, relating to Eastman Professional Films and Plates and Wratten and Wainwright Plates. We recommend them to you, confident that they will secure for you the finest results possible with products of our manufacture. Photography is so essentially a chemical process, involving the most delicate reactions of chemicals in solution, that the chemical materials used in photographic processes must have—in the greatest degree—purity, strength and uniformity. That is Why we make and recommend Eastman Tested Chemicals.